With inequality on the rise, is wealth redistribution the answer? As the world faces an upsurge in nationalist and anti-globalist movements, participants at the World Economic Forum in Davos this week considered a novel “old” cure: wealth redistribution. But they seemed split over the model (voluntary or through taxation), and over whether a more familiar recipe wasn’t better: to make the pie bigger, rather than to give others a bigger slice. 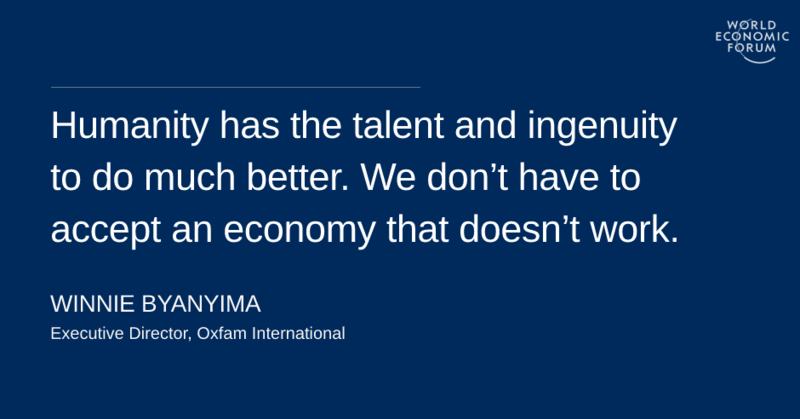 Have leaders in Davos got the message? Her message was echoed by many participants. In a dinner session on Tuesday, Oxford academic and writer Ian Goldin repeated a conclusion he came to in his book, Age of Discovery. It is that “individuals and societies need to be smart and well organized to emerge as ‘winners’ in a new renaissance,” as the FT paraphrased it. “They should create social safety nets for the dispossessed.” In other words: the wealthy should share more with the rest of society. Some participants went even further, supporting a plea made by Scott Santens that “we should all have a basic income”. Most notably, World Economic Forum Foundation Board Member Marc Benioff opined in Fortune that “we need to look at universal basic income, where governments would provide citizens additional income beyond what they already earn at their jobs.” And Guy Standing, a Research Professor in Development Studies, launched a similar call in his session. But for every advocate of redistribution and corporate action, there seemed to be another one for government “laissez-faire”, preferring a pro-growth medicine to heal the ails of a struggling middle class. “Davos would do better thinking of growth, rather than redistribution,” Ken Moelis, Founder and CEO of Moelis & Co. told the Wall Street Journal’s Matt Murray. Ray Dalio, founder of the American investment firm Bridgewater Associates, suggested the key to reinvigorating the middle class was to “create a favourable environment for making money,” The New York Times reported. He touted in particular the “animal spirits” unleashed by stripping away regulations. Is Davos out of touch with populism?